If you fill up Smart pre-order page for Samsung Galaxy Note 3 we’re sure you already received the postpaid plan pricing of this smartphone. To those interested and not able to catch Smart pre-selling page we are going to feature one plan amount of Galaxy Note 3 for your reference. This available free on LTE Data Plan 200, includes 3G/LTE internet, 200 SMS texts and 150 minutes call to all networks. 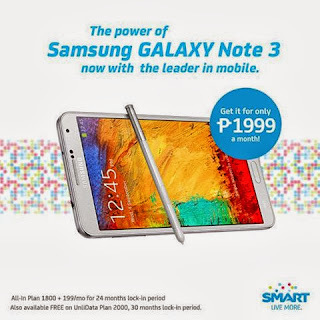 For more details about Samsung Galaxy Note 3 plan pricing, go visit your nearest Smart store on your area and inquire about this plan.